As I mentioned in my last post, I just recently returned from a trip to New York City and the Hamptons, visiting with family, friends and celebrating my dear cousin’s 90th birthday, and thought I’d share my tasty dining adventures. While in the city, my Mom and I stayed in a quaint, boutique hotel on Madison Avenue, and unfortunately, they were in the process of renovating their restaurant so can’t comment on their food (except for the continental breakfast served in the Penthouse, which was your typical fare, consisting of bagels, cereal, danish and toast). For our first night in town, we visited my brother and his family, who live on the upper west side, and right around the corner from a delightful Italian restaurant, Bello Giardino. We were seated outside on the patio, which was quite lovely, as the temperature had cooled down from the heat wave the east coast was experiencing the week prior. While I really enjoy Italian food, I don’t dine out at Italian restaurants all that often, but when I do, I usually choose some type of ravioli or tortellini, and this night was no exception. 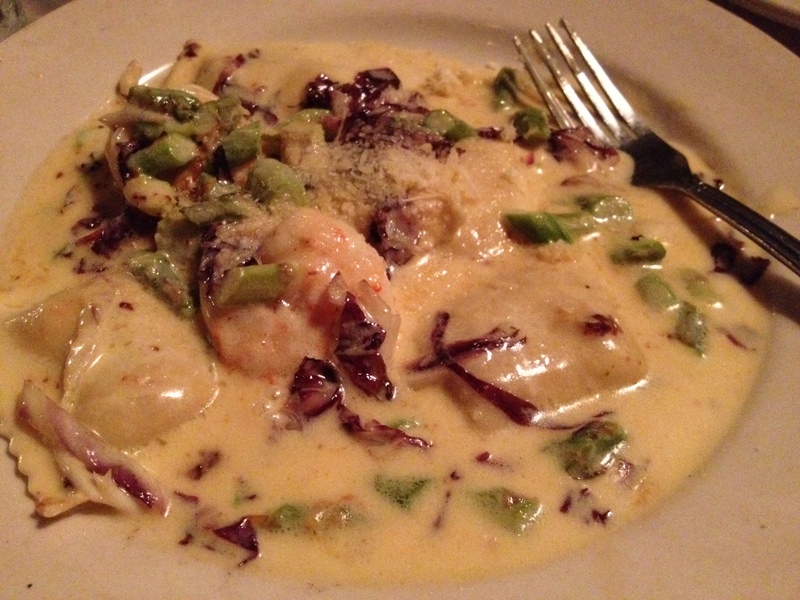 I decided to go with their Ravioli Giardino, which is lobster ravioli in a brandy cream sauce with shrimp and asparagus. I give two thumbs up to the chef as this was absolutely delicious! Day two was another trip to the upper west side to see family (we can’t get enough of my three-month old niece). Lunch time rolled around and my sister-in-law took us to Isabella’s on Columbus Ave., which was another cute restaurant with an outdoor patio. We opted to sit outside to enjoy the scenery and beautiful weather. The menu had many desirable options for me, but I was really in the mood for a burger and fries, so I went with their Tuscan turkey burger, mixed with aged provolone, lettuce & tomato, cranberry ketchup, a whole wheat bun, and sweet potato fries which came with a maple-mayo (maplenaise) dipping sauce. Okay, I have to tell you the cranberry ketchup was brilliant and had an incredible flavor. This will definitely be a new condiment in my house. I haven’t made it yet, but keep a lookout for this recipe. Oh, and then there’s the maple-mayo dipping sauce. Holy sweetness (in a good way)! What an awesome compliment to the sweet potato fries. Seriously. I spoke to our server about it in lengths, and she said she can’t get enough it. I plan to also make this very soon, which, from what I was told, is just a mixture of the two ingredients so should be an easy recreation. Obviously, another two thumbs up as everything was scrumptious! 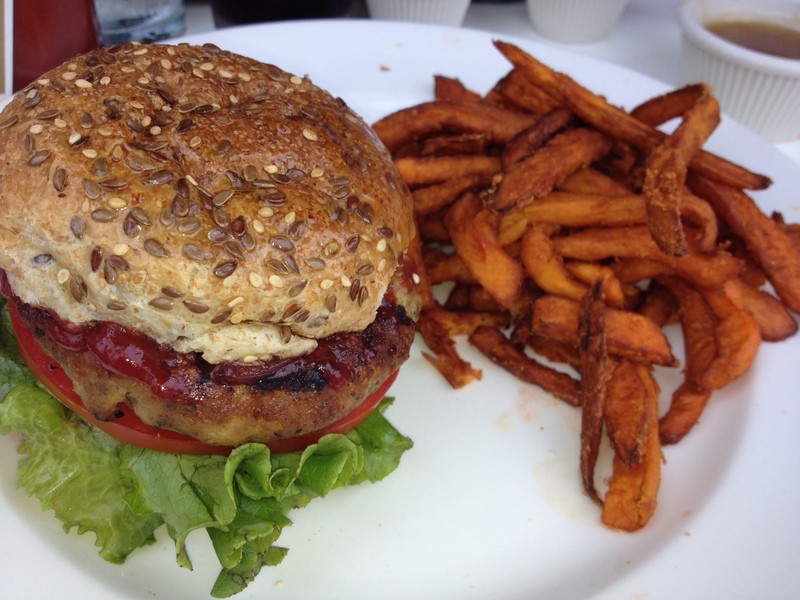 Turkey burger with cranberry ketchup, and sweet potato fries with maple-mayo dipping sauce. I made dinner reservations for our last night in the city to meet up with a dear friend of mine. Not to toot my own horn (but I’m going to)… I chose an excellent restaurant called Mercer Kitchen located in SoHo. The atmosphere is pretty cool… a dining room upstairs that is bright with a bunch of windows, and downstairs, you’ll find the bar and another dining room with more of a romantic ambience as it is much darker (I did have to use my iPhone light to see the menu). Looking back, I should have asked for us to be seated upstairs so I could check out the foot traffic outside since this was my first time in SoHo. My bad. 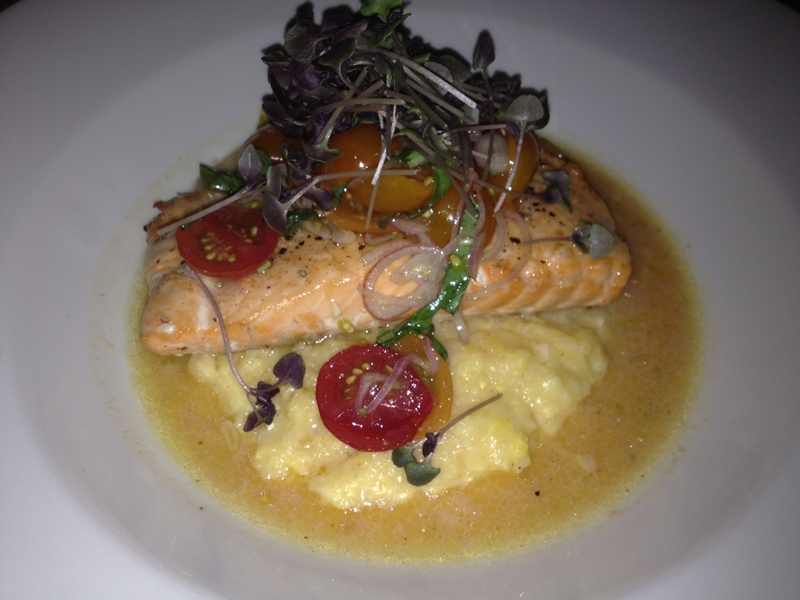 I had a slightly difficult time deciding what to order because so many things looked good to me, but opted for their slowly baked salmon with cherry tomato vinaigrette and corn pudding. Needless to say, there wasn’t a morsel left on my plate… it was that good! My Mom ordered the black truffle and fontina cheese pizza, which was also excellent. And my friend who got the Mercer burger with pepperjack cheese, avocado, crunchy red onions, and russian dressing, accompanied by french fries, said it was the best burger she’s had in a long time. Let’s not forget about the dessert!! This was simply the perfect end to an amazing meal! 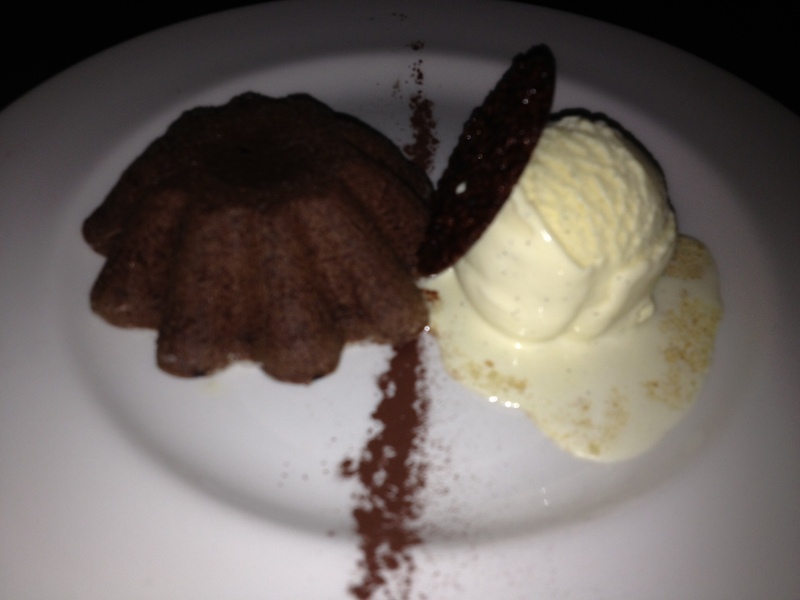 It should be noted that they made the little cake after we ordered it, so it was fresh out of the oven. I could have easily eaten the whole thing myself, but we all shared it 🙂 Hat’s off to the chef for three delicious meals and a delectable dessert, and to the wait staff for being very attentive! Next stop… the Hamptons! 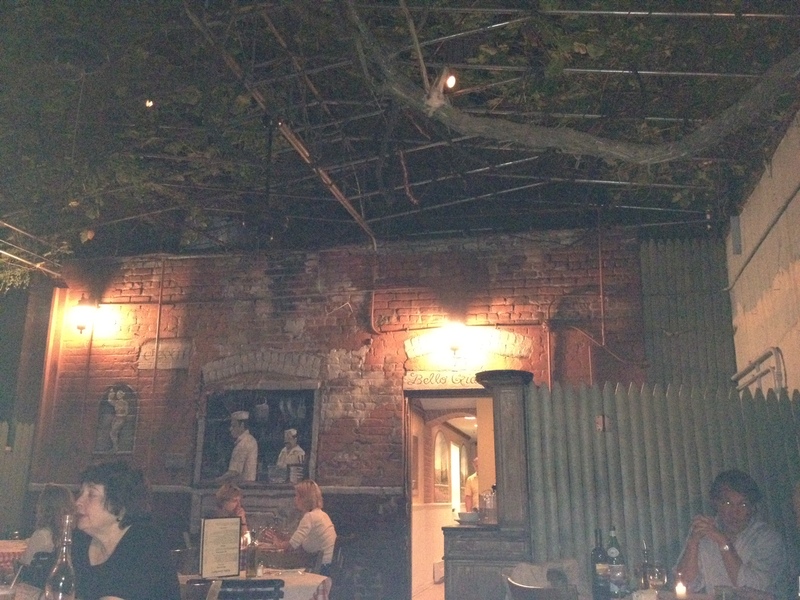 Although I wasn’t as food-picture-happy there, I want to note a couple of places we ate at that should be mentioned. Located right next to our B&B in Montauk is a place called the Surfside Inn, where we grabbed a late lunch right after we arrived. Being that it was just after 3 p.m., we were the only ones dining, which didn’t matter to us since we were hungry after our 3+ hour commute from the city. 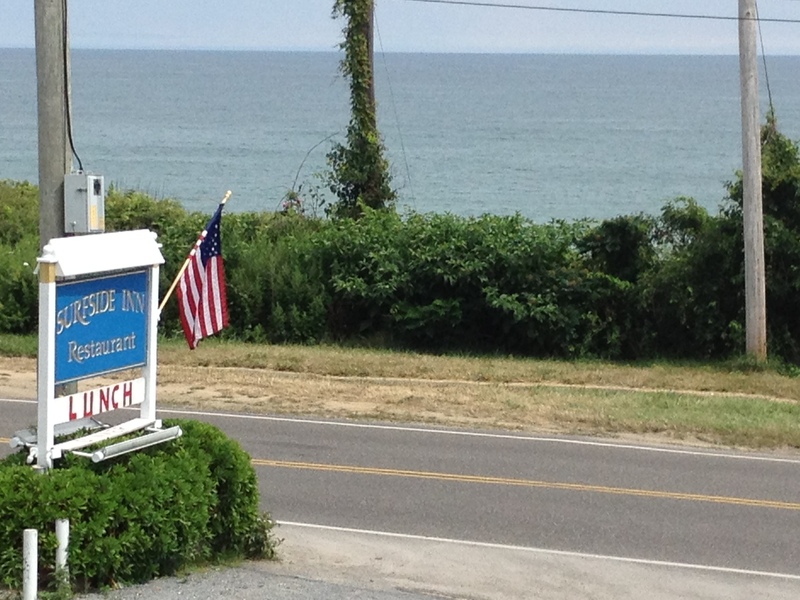 They had a nice porch overlooking the ocean, so clearly a no-brainer to sit out there. I had a cheeseburger with fries… I know, not the healthiest of options, but had to go with what I was craving at the time. I really enjoyed my meal and the incredible view with my Mom, and would definitely go back. Two other places we went to were Bird on a Roof, which is a small, cool, beach town breakfast place that has a huge menu. Nothing fancy, but it has great food and friendly service. I must thank my cousin, Melissa, for sending us there! The other one is called Bliss, where we grabbed lunch one day. It’s a walk-up and order-your-food type of restaurant, consisting of sandwiches, paninis & wraps, burritos and tacos, and other tasty options. They have picnic benches and umbrellas outside, where they bring you what you ordered at the counter. Simple, but good eats and a cute place. 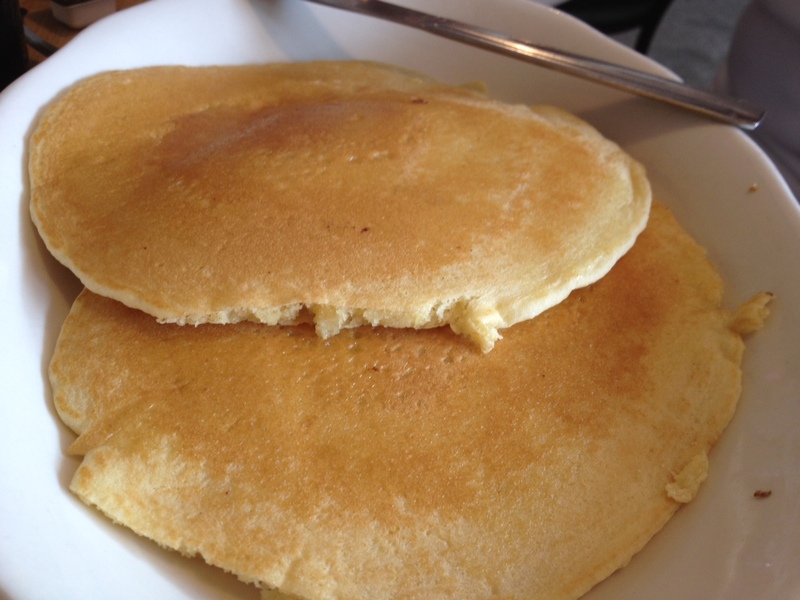 Our last morning in the Hamptons (Montauk), we decided to go a really popular placed called Mr. John’s Pancake House. I now know why there is always a line waiting outside… super yummy breakfast food. You definitely need to check it out if you go there. 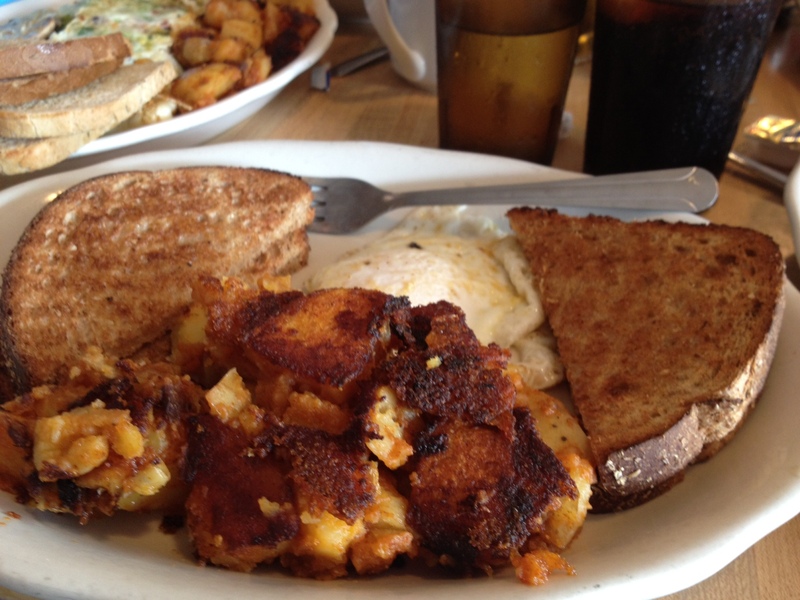 I had eggs, sunny-side up, with potatoes and toast, with a side of pancakes, and everything was delish! I’m already looking forward to my next visit there. We did eat at a couple of other establishments, but I feel they aren’t worthy enough to be mentioned (I’m a tough critic). However, if you make a trip to NYC and/or the Hamptons, I highly recommend you visit some of the places I mentioned on here.